EXPEDITION NEWS, now in its 20th year, is the monthly review of significant expeditions, research projects and newsworthy adventures. It is distributed online to media representatives, corporate sponsors, educators, research librarians, explorers, environmentalists, and outdoor enthusiasts. This forum on exploration covers projects that stimulate, motivate and educate. IS THIS THE WORLD'S TOUGHEST EXPEDITION? That's the claim being made by Nick Cienski, 47, mountaineer and designer for Under Armour for his planned attempt to climb all 14 of the world's 8,000 m peaks within two years. Tough? Yes. Toughest? We have our doubts, certainly compared to dogsledding across Antarctica for seven months, 3,400 miles, in minus 20 to 30 degrees F. - a feat Will Steger and his team achieved in 1989-90. Nonetheless, the $5.7 million Mission 14 project promises to be an extraordinary adventure, all in the name of calling attention to human trafficking. Cienski's nonprofit will partner with other anti-slavery organizations to raise funds for the cause. For each climb, one Sherpa will guide Cienski, and a core 65-member Sherpa crew will haul gear and run ahead of the duo to set up ropes and base camps, so Cienski can travel with as minimal weight as possible. Helicopters will be used where necessary to accomplish in two years what usually takes seven years or more. "I will attempt to break multiple world records on the most daring high altitude expedition in history," he boasts on his website. To protect his body from the elements, he designed a 14-piece clothing line that uses Cocona fabric that blends polyester with burned carbon and other naturally derived particles. "Mission 14 is fundamentally about changing lives," Cienski writes. "We are not climbing mountains to be famous. We are climbing because we believe there are ways to release children from poverty that haven't been done yet." Additional sponsors are Asolo, GoalZero, and Under Armour. In August, Jake Norton, Pete McBride, and David Morton will begin a journey to tell the story of the Ganges River, one of the world's most polluted major waterways. They'll begin on an unclimbed peak at the headwaters of the river, and then follow its course from the high Himalaya to the Sundarban Delta. Along the way they'll tell the river's story through the eyes of those who love it and hate it, protect it and pollute it, revere it and revile it. The project will be documented on film, in still imagery, and written word. Throughout, team members will be blogging, updating social media, and sharing the story of the Ganges from source to sea. Norton, an Evergreen, Colorado, photographer and videographer, tells us, "Hindus believe the Ganges is a sacred river - a divine, all-purifying entity. To bathe in the Ganges, to be cremated on its banks, are among life's greatest honors." The project begins with an unguided, alpine ascent of 22,589-ft./6885 m Chaukhumba IV at the head of the Gangotri Glacier, the source of the Ganges River. Sponsors include Eddie Bauer and the Microsoft Surface Pro, who Norton initially contacted through LinkedIn. "For me to transition from just bagging yet another peak to actually doing something good is especially gratifying - we can tell a bigger story," Norton says. On Oct. 12, 2002, freediver Audrey Mestre, then 28, died in a freediving accident approximately 2-1/2 miles off the southeast coast of the Dominican Republic. She was attempting to officially break the record in the "No Limits" category, which involves riding a weighted sled down the length of a vinyl-coated stainless steel cable to a depth of 557.7 feet (170 m). It was a depth she achieved unofficially during a practice dive three days before. A new ESPN documentary, directed by Alison Ellwood and based in part on the book The Last Attempt by Carlos Serra, concludes Mestre's husband, freediver Francisco "Pipin" Ferreras, placed her life in danger so that he could rescue her at the last minute. The Mestre tragedy is chillingly detailed in No Limits, an ESPN Films and espnW Nine for IX documentary that revisits her story and how she died. Her death left Francisco "Pipin" Ferreras – her mentor and fellow world record freediver 13 years her senior – accused of everything from abject carelessness to runaway egotism to suspicions of sabotage, even speculation about whether it was outright murder. Serra speculates that Ferreras might have deliberately left the tank that was supposed to bring Mestre to the surface empty so he could have been the hero who rescued her before she surpassed him. The official cause of her death was ruled as "drowning." Expedition News witnessed the tragedy; the video footage, which we had never seen before, remains a horrifying reminder of a day that still haunts us. Last month we wrote about the death of American adventurer, mountain climber, sailor, skier, photographer, journalist and author, Ned Gillette, of Sun Valley, Idaho, who was killed in Pakistan in 1998. Edward "Ned" Gillette, then 53, was shot to death in his tent in an apparent botched robbery attempt. His wife, Susie Patterson, then 42, was injured in the attack and recovered. Two suspects were taken into custody and charged with murder and assault. Recently we heard from Patterson who is single and lives in Sun Valley, traveling whenever possible, and running a photography business called Gillette Photography. Ned's name lives on through a well-endowed scholarship fund with the Holderness School in Plymouth, N.H. The Ned Gillette Spirit Award is awarded annually to the graduating senior whose career at Holderness best reflects Gillette's genuine leadership, competitive attitude, and spirit of adventure. Patterson e-mails, "I am biased of course, but Ned was extraordinary in his approach to expeditions. Yes, he was a pioneer, trying to retain the integrity of the expedition, unselfishly bringing something back and remaining as true as possible to those (ideals) of the old explorers." She continues, "For me, he drew out something I really didn't know I had inside of me. I guess we both trusted one another and had no need to outdo one another. We were partners. The life became me. I learned and lived so much thanks to this travel into the remote places westerners had never been or perhaps will never go again." Travel writer and blogger Charles Scott, 45, the so-called "Family Adventure Guy," was profiled in EN's November 2010 issue for his bike trip across Japan with his son. After circumnavigating Iceland by bike in 2011, he's now in the midst of cycling 1,703 miles of the Lewis & Clark trail and testing the limits of quality family time. With him is his son, Sho, 12, and daughter Saya, 6. At press time they were in Montana, with miles to go before reaching the Pacific Ocean. Another goal is to raise $15,000 for a self-published book, a video documentary, and a speaking tour once they're done. At press time they were over halfway towards raising the money on Kickstarter. Working with Adventurers and Scientists for Conservation, based in Bozeman, Mont., they are collecting roadkill data in an effort to reduce the impact of roads on wildlife. When they find a dead animal along the roadside, information is sent to Professor Fraser Schilling at the UC Davis Road Ecology Center, who is posting their data on a tracking site. Gregg Treinish, founder of ASC, tells EN, "This is an adventure with a purpose. Charles and his children are mapping where we need to apply mitigation techniques. "We're learning about animal movement across highways. His kids, and the kids who follow their blog, learn about something they'll never study in school because of the gross factor." No more Mr. Nice Guy. Nepalese officials say that for the first time, starting next year, a government team will be located at Everest base camp to monitor and help expedition teams, coordinate rescues and protect the environment. The move follows embarrassing incidents on the mountain, including a fight between Sherpas and mountaineers. Starting with next year's spring climbing season, the team at base camp will represent the government's administration on the ground. Observers say it was getting difficult to regulate mountaineering activities from the capital, Kathmandu. Current rules require each climbing team to have a government employee as a liaison officer during expeditions. But there has been widespread criticism that designated liaison officers often do not even leave Kathmandu and there is no one to regulate expedition teams on the mountain. Officials and mountaineering experts also said the new regulations would constrain what they described as a growing competition to set bizarre records. They said climbers would be required to announce beforehand if they planned to set any record. "We have had many examples in the past when climbers did not share their plan to set a record beforehand and they made the record claims only after they reached the summit," said Ang Tshering Sherpa, the immediate past president of the Nepal Mountaineering Association – a professional body of expedition operators. "These days we see people trying to make bizarre records like, for instance, standing on their head or taking off their clothes while on the summit. "These behaviors don't bode well for the dignity of Everest, which is a global icon," said Tshering, who is also a member of the committee that has recommended the new rules. Huawei announced earlier this month partnering with China Mobile on the successful deployment of 4G coverage some 17,060-ft./5,200 m above sea level on Mount Everest. This is about 3,000 meters short of the actual summit, but as hikers wait to finish their climb, at least they'll have Netflix and Twitter to pass the time. Unless of course the call is dropped. The coverage was deployed in June when China Mobile demonstrated a series of new 4G technologies, including live HD video streaming from Everest base camp. In 2010, Nepali telecom company Ncell launched the first 3G services at base camp and made the first successful call from an altitude of 5,200 meters. Two years later, Huawei and China Mobile worked together to create Global System for Mobile communications (GSM) coverage for the 2008 Olympic Games torch relay leg that went part way up the mountain. In addition to excellent PR for the two companies, the GSM and 4G coverage is intended to improve climber safety on the increasingly crowded mountain. You've got to love a trade show that not only allows dogs but issues them credentials in the form of neck badges. At the Outdoor Retailer Summer Market in Salt Lake last month, there's even doggie daycare, called Camp Bark-a-Lot. The big news this year was in gizmos that charge cellphones and other gadgets using fuel cells. MyFC PowerTrekk from Industrial Revolution, Inc., is a portable fuel-cell charger for USB-compatible electronic devices. Each $4 puck provides 1-1/2 iPhone charges. Just fill it with a few drops of water or, if you're short on water, it'll run on urine, of which, presumably, you'll have plenty to spare. It's considered ideal for emergencies or when solar is less than optimal. $229.99 msrp. Another exhibitor featured the Brunton Hydrogen Reactor which stores enough power to recharge a phone five to six times. Extra fuel cells weigh only an ounce, and can be refilled, recharged or recycled with no environmental damage. $150 msrp. The PowerPot V from Power Practical, Inc., is a thermoelectric generator that uses heat and water to create portable power. Add water to the PowerPot and place it over any heat source. It's said to charge as fast as a standard outlet. $149 msrp. When the fuel cells die, or your stove runs out of fuel, Eton's Boost Turbine 4000 is ready to take over the old-fashioned way - it sports a hand-crank generator to provide power. One minute of cranking the hand generator provides enough power for a few texts or four minutes of talk time. $79.99 msrp. A white staircase for our Gods. White flags waving our prayers in the winter wind. White soldiers guarding all that is sacred in our land. White border to my universe. O' Himalayas, how many ways do I love you. A Canada-born hypnotherapist with only a few minor acting credits will play Sir Edmund Hillary in a 3D film recreating his 1953 conquest of Mt. Everest. Beyond the Edge will premiere at the 2013 Toronto International Film Festival, Sept. 5 to 15, 2013. Filmed on location in the Southern Alps of New Zealand, the Himalayas and Mt. Everest itself, the movie centers on Sir Ed's historic 1953 ascent. Wellington, New Zealand's Chad Moffitt, whose previous roles included playing a flesh-eating zombie, won filmmakers over for the Hillary role with a simple approach – he sent in a photo of himself holding a $5 note bearing Hillary's face. His resemblance to the mountaineer has delighted Hillary's son, Peter, and family. Hillary's granddaughter, Anna Boyer, said photos of the actor in the movie bore a striking likeness to her grandfather even though Moffitt is five years older than when Hillary topped the world. Moffitt will be joined on screen by Sonam Sherpa, who will portray Tenzing Norgay. Sherpa is from Nepal but is a New Zealand resident living in the Mt. Cook region. Written and directed by Leanne Pooley (The Topp Twins:Untouchable Girls), Beyond the Edge mixes archival footage with dramatic re-creations of the ascent. Hollywood May Scale "Everest"
Another production company .... yet another Everest film. Jake Gyllenhaal, Josh Brolin, Jason Clarke and John Hawkes are all in talks to star in Baltasar Kormakur's mountain climbing drama titled, Everest. The Universal Pictures film, produced by Working Title, is based on various books and interviews following the 1996 expedition to scale the peak when climbers were blasted by a huge storm, claiming the lives of eight. The disaster was the focus of the popular nonfiction book Into Thin Air, written by Jon Krakauer, who had first-hand knowledge of the tragedy from his vantage point on site, writing about it for Outside magazine. Krakauer and his work were criticized post-publication, and it's perhaps because of this that the film will be based on several written sources beyond Into Thin Air, as well as interviews with some of the survivors. Production is set to begin in November. What Drives James Cameron To Conquer The Unknown? "When you have the feeling that anything's possible, sometimes you wind up acting on it," said James Cameron in a wide-reaching interview with Rahim Kanani that appears in the July 11 Forbes. In explaining his deep sea projects, Cameron says, "There are two aspects to it. There's the building of the sub, in which case we were pioneering new advances in several areas: pressure balanced electronics, structural materials, fiber optics, cameras, lighting, propulsion, composite materials, and fluid dynamics. None of this stuff existed off the shelf. We had to develop everything from scratch to withstand the pressure, almost double what the other operational human-occupied vehicles were capable of withstanding. "There was the issue of the material science – of what we were actually going to build the vehicle out of structurally - which is called syntactic foam. We had to develop new generations of materials that didn't exist before. So there was a material science aspect to it. So, yeah, I had to go to school on all sorts of new disciplines. But that to me was a given, it was the challenge, and in the challenge is the fun." Cameron goes on to say of his submersible, "It's not like I scaled some mountain or I whipped my dogsled across the Antarctic wasteland – some heroic feat. I just got in the thing and dove it. There were some challenges in piloting it, of course, but the major challenge here was the engineering challenge – building the thing. My pride is not in my accomplishment. My pride is in the team's accomplishment." Of Richard Branson's work in space tourism, Cameron sniffs, "He's basically just catering to a bunch of rich people who want to go to space. And they're not really even going to space. It's suborbital. ... And there's no research component. Branson's not interested in research at all. I've talked to him about this. He's just not interested. For him it's about a lifestyle and fun and all that. That couldn't interest me less." This time of year, when days in the northern hemisphere are long and sweltering, those near the South Pole reach lows of minus 100 degrees Fahrenheit or less, and the continent is in the throes of its yearly six months of darkness, according to Olga Khazan's July 15 story in The Atlantic titled, "On Getting Drunk in Antarctica." Each winter, the few dozen workers at the Amundsen-Scott South Pole Station spend nine months in total isolation: no airplanes can fly in or out until the base "warms" up to minus 50° F – otherwise the fuel might freeze and kill the engine. To amuse themselves, workers at the research station engage in daredevil stunts, like running from a 200° F sauna to touch the South Pole while wearing nothing but shoes. They also drink. A lot. Alcohol consumption is the ugly side of living in the "big dead place." Khazan writes, "A bored, trapped, and cold population naturally gave rise to a bar. Club 90 South was a simple, wood-paneled joint with a hole in the wall opening up to the outside, where the bartenders would put the Jagermeister to keep it chilled. Massive pallets of beer, wine, and liquor were flown in with the winter crew, and they prayed it would last them all nine months." There were occasional teetotalers and plenty of moderate drinkers, but for some, alcohol became a refuge. At Club 90 South, serving someone in a bar until they passed out was sometimes a better option than letting them drunkenly wander outside by themselves. Says one volunteer bartender, "The most dire danger in Antarctica is always failure to respect the absolutely lethal environment of Antarctica itself. I was far happier to serve until I could guide him (a co-worker) over to a couch to pass out than to see him stagger out into the minus 85° F night." A contributing writer to Diver magazine wants to know about projects and groups that use volunteer scuba divers for their research/conservation/exploration projects out in the field. Lisa Sonne has already written about nonprofit aquariums that depend on volunteer divers. Now she would like to know about upcoming projects that need volunteers, as well as hear from those who have volunteered in the past, and those who have used volunteers. After a grueling five years and 11 days, Erden Eruç completed a circumnavigation of the globe using a rowboat, bicycle, kayak, dugout canoe and his own two feet. Along the way he traveled over 41,000 miles, rowed across three oceans, traversed three continents by bicycle, climbed two mountains, and spent almost 780 days alone at sea in his rowboat. Now comes his biggest challenge of all: raising enough money through Kickstarter to fund a feature documentary about his project. Eruc, a so-called "Castaway with a Purpose," is seeking $50,000 to assemble his story from a vast amount of film, photos and written journals. Minimum pledges start at $1. Donate $10,000 or more and you get a cruise and an above-the-title credit as executive producer. At press time he had 188 backers donating $36,507 towards his goal. The deadline is Aug. 18. At lunch recently, we asked Eruc, 52, how he occupied his time at sea when he wasn't filming video. "I had a chance to ask myself questions that were long overdue." He also told us that in 876 days he saw the elusive "green flash" only once on the horizon. "I read about it. I was curious about it, so it's good to know it really exists." So much for any of us seeing it on our next Caribbean vacation. The Friday Harbor Documentary Film Festival in Washington state, presented by the Pacific Islands Research Institute, will feature award-winning documentary films about the diverse cultures and environments of the Pacific Rim. Films will feature fascinating island cultures, revealing marine ecology, heroic adventures, sustainable agriculture, social justice, current environmental issues and stirring human interest stories. Filmmakers will be on hand throughout the event to introduce their films, participate in a forum on documentary filmmaking, mingle with filmgoers and answer questions. If you have a project that is bigger than yourself – a trip with a purpose – learn how it's possible to generate cash or in-kind (gear) support. Written by EN editor Jeff Blumenfeld, it is based upon three decades helping sponsors select the right exploration projects to support. Payable by PayPal to blumassoc@aol.com, or by check to Expedition News, 1281 East Main Street – Box 10, Stamford, CT 06902 USA. 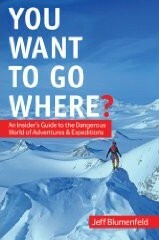 EXPEDITION NEWS is published by Blumenfeld and Associates, Inc., 1281 East Main Street – Stamford, CT 06902 USA. Tel. (+1) 203-655-1600 editor@expeditionnews.com. Editor/publisher: Jeff Blumenfeld. Assistant editor: Jamie Gribbon. Research editor: Lee Kovel. ©2013 Blumenfeld and Associates, Inc. All rights reserved. ISSN: 1526-8977. Subscriptions: US$36/yr. available by e-mail only. Credit card payments accepted through paypal.com. Read EXPEDITION NEWS at expeditionnews.com. Enjoy the EN blog at ExpeditionNews.blogspot.com.